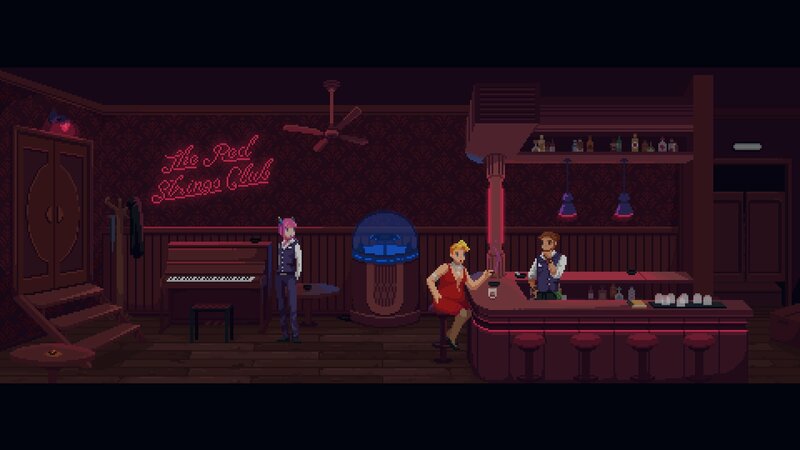 Go down in pixelated style with our contest for a Switch copy of The Red Strings Club. The good thing about games published by Devolver Digital is that you know you're going to get some slick, stylish, and totally different than what most games are doing. Developer Deconstructeam has clearly put something cool together to have been picked up by Devolver. Check it out for yourself by winning a Switch copy of their newest game The Red Strings Club! This one's a bit of a mind-bender, so I'll let the PR talk take control from here. The Red Strings Club is a cyberpunk narrative experience about fate and happiness featuring the extensive use of pottery, bartending, and impersonating people on the phone to take down a corporate conspiracy. The professed altruistic corporation Supercontinent Ltd is on the verge of releasing Social Psyche Welfare: a system that will eliminate depression, anger, and fear from society. However, the bartender of a clandestine club and a freelance hacker don't regard this evolution as an improvement but as brainwashing. Alongside unwitting company employees and a rogue empathy android, the duo will pull all the strings they can to bring down this scheme. Cyberpunk Thriller Narrative -- Uncover a mysterious corporate program that promises a blissful existence while debating what does happiness means and what lengths are permissible to obtain it. Psychological Bartending -- Read your customers' mood and mix the perfect cocktail to manipulate the client's emotions in order to gather the information you want and progress your agenda of stopping Supercontinent's plans. Genetic Implant Pottery -- Design genetic implants at a high-tech lathe to change the attitude and direction of the corporation's most influential executives. Vocal Corporate Espionage -- Assume the voice of important figures in the Social Psyche Welfare project and play their own motivations against each other over the phone to uncloak their plans. Bartending? Pottery? Vocal espionage?! This hit my checklist for "A perfect Sunday." To enter to win your copy, use the comments below to tell me how using bartending, pottery, or vocal espionage could help you break into Destructoid HQ. As you know, we're guarded by a legion of very aroused -- and arousing -- robots, so you're going to have to get creative to break down our defenses. We have seven Switch keys to give away, all for North American eShop accounts, only. Winners will be drawn on Sunday, March 24. Be sure to comment using a Dtoid account with your current email address on file. New users can sign up here and plot how to break into my cubicle and commit the ultimate crime: Rearranging the crap on my desk. The Red Strings Club is available now for Nintendo Switch. Head over to Nintendo Enthusiast for more chances to win!